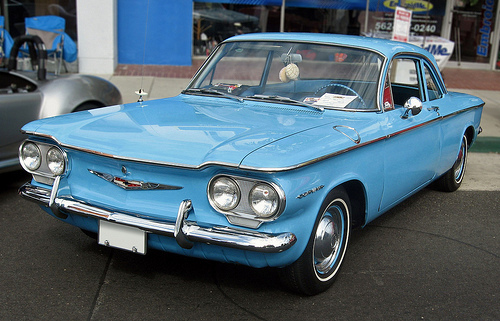 Although the Chevrolet Corvair, launched in October 1959, was not the U.S.-market sensation GM hoped, it made a strong impression on European automakers. The Corvair was not exported in large numbers, but its styling was extremely influential, spawning imitators ranging from Volkswagen’s Type 34 Karmann Ghia to the Hillman/Sunbeam Imp. Some European stylists also essayed custom-bodied Corvairs of their own, like the 1961 Pininfarina Speciale and the 1963 Bertone Testudo, a fastback coupe with a lift-up canopy in place of conventional doors. Not to be outdone, the Chevrolet studios turned out a few radical Corvairs of their own, most with shortened wheelbases and very sporty styling. The earliest of these, the Sebring Spyder and Super Spyder, were primarily showpieces, intended to tease new production models. In 1962, however, work began on a somewhat more serious project, known internally as XP-797. There were two variations: a rear-engined roadster, later dubbed Monza SS, and a mid-engine coupe, the Monza GT. The Monza GT coupe was designed by Larry Shinoda and Tony Lapine and engineered by Chevrolet’s Research & Development department. Developed over the course of about 10 weeks in the spring of 1962, the GT was a racy-looking fastback with a three-piece fiberglass body on a semi-unitized aluminum platform. Like the Bertone Testudo, it had a one-piece canopy that flipped forward for entry and exit; the front and rear body sections also tilted up for access to the powertrain and suspension. While the engine was a stock dual-carburetor Corvair flat six, it was mounted ahead of the rear axle, making the GT a mid-engine car. The GT and SS roadster were first seen in public at the Sports Car Club of America’s Elkhart Lake 500 in June 1962, followed by appearances at a number of other SCCA events. 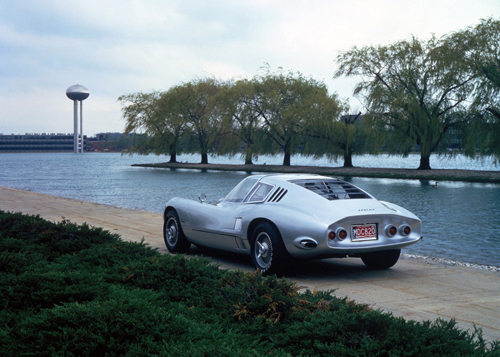 Those excursions were apparently for development purposes rather than publicity; in fact, Chevrolet asked journalists not to talk about the experimental cars until around the time of the car’s formal debut at the New York Auto Show in April 1963. 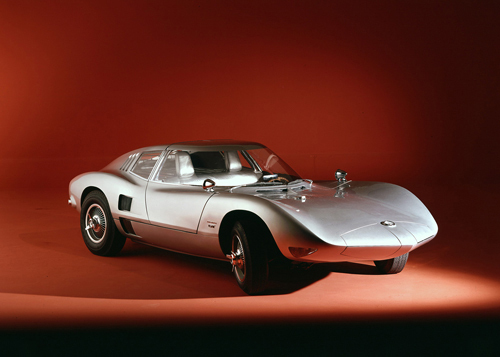 Bill Mitchell, then vice president of GM Styling, wanted to see the Monza GT in production — in fact, he later claimed that he saw it as a potential successor to the recently introduced Corvette Sting Ray. However, that idea found little management support. The Corvette itself was still on shaky ground as far as the corporation was concerned and Mitchell said Chevrolet was just not interested. The XP-797 project was abandoned, although the Monza GT and SS survive today in the collection of GM’s Heritage Center. The stylistic impact of the Corvair was not lost on officials of GM’s German subsidiary in Rüsselsheim. Adam Opel AG was then doing respectably well in Europe, building around 300,000 cars a year, but stylistically, it simply didn’t rate. Opel didn’t even offer convertibles or hardtops in those days, just an array of competent but dull sedans and Kombis (wagons). Unlike its U.S. parent, Opel didn’t indulge in fanciful show cars, either. Rüsselsheim’s tiny design staff comprised fewer than a dozen artists and modelers crammed into a rather small space, reporting to chief engineer Hans Mersheimer. Any advanced concepts they may have developed were strictly for internal consumption. By 1961, Nelson J. Stork, then Opel’s managing director, and E.S. Hoglund, GM’s VP of overseas operations, had decided that Rüsselsheim needed an infusion of U.S. design talent. Bill Mitchell arranged for Hoglund to interview some of his top designers, including Chuck Jordan, then chief stylist for Cadillac, and Irv Rybicki, then head of the Oldsmobile studio. The one Opel management ultimately selected, however, was Clare MacKichan, for the last decade the chief stylist of Chevrolet. MacKichan had overseen a variety of memorable designs, including the Corvette, the 1955–1957 Chevrolets, the Nomad, and of course the Corvair. In early 1962, MacKichan was transferred to Rüsselsheim, with Irv Rybicki taking his place at Chevrolet. Under MacKichan’s direction, Opel’s styling department gained additional staff and a new design center. Unsurprisingly, over the next few years, Opel’s production cars began to take on a more American look. If they had been fitted with sealed-beam headlights, cars like the bigger Rekord B and C wouldn’t have looked out of place in contemporary Chevrolet catalogs. Indeed, the new Kadett was sold through some U.S. Buick dealers. Another of MacKichan’s moves was to establish a new Advanced Design group, headed by Erhard Schnell, a designer who had been with Opel since the early 1950s. Among the Advanced group’s early projects was a sports car, something Opel hadn’t even contemplated in some 40 years. Known internally as Projekt 1484, the sports car was initially developed in great secrecy. Even Nelson Stork didn’t see it until 1963, many months after the project began. Excellent article which covers all bases of this car’s history. Great job and keep up the good work guys! 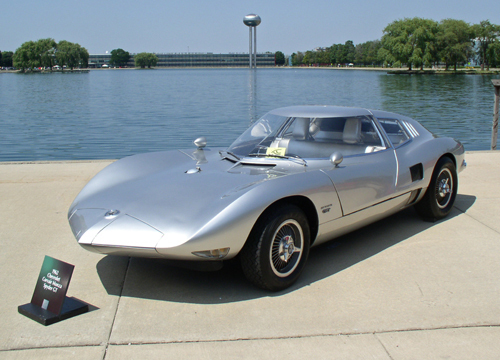 I am rather surprised that nothing was mentioned about the Pontiac Banshee. To me it seemed closer in styling and concept. Though I don’t know that the development of the Banshee had anything to do with the Opel. I mentioned it in passing in the sidebar (and I discussed the Banshee project at length in the Fiero article), but as far as I know, there’s no direct connection between the two other than their general conceptual resemblance. Bill Mitchell was obviously aware of both of them (and was apparently keen on the idea of a small sports car), but most of what I’ve read about the Banshee suggests that it was driven more by DeLorean than Mitchell. Still, the Opel and the Pontiac were developed at roughly the same time, and it does raise the question, “Why was Buick selling a small sports car in 1969 when GM had vetoed Pontiac’s attempt to do the same thing five years earlier?” I think the answer has more to do with Buick’s established relationship with Opel than anything else; if Buick had developed the GT in-house, I suspect they would have gotten the same response DeLorean did. Growing up in germany in my late teens the Opel GT (and the Ford Capri) immediately caught my attention as it brought some drama to a rather uninspired car design scene. Unfortunately my pockets weren’t deep enough to afford one. But during the 1969 IAA in Frankfurt I was invited to the Opel Design Center in Ruesselsheim. I had the good fortune to meet Erhard Schnell who showed me round the less sensitive areas including clay models of the Aero GT and the Opel CD Concept. Allow me two comments. 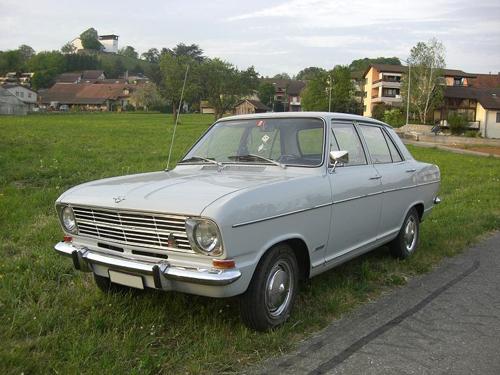 I am surprised you did not include a picture of the NSU Prinz 4, the absolute best clone of the original Corvair, albeit at miniature scale. The main reason I included a picture of the Imp, rather than the Prinz 4 or some of the other obvious Corvair scions, was just that I had one handy. The list of cars obviously influenced by the Corvair is lengthy — Paul Niedermeyer over at Curbside Classic did a more exhaustive survey last year. There are two different Kadett coupes shown: a red one that I *think* is a ’67 (please correct me if I’m wrong) and a 1969 LS fastback coupe. They’re definitely not the same car. Again thank you for the great work!!! Thanks for the clarification! Detailed information on workaday Opels of this vintage is a little scarce for those of us who don’t read German, and identifying model years is made more challenging by the disparity between when models were released in Germany and when (or if) they appeared in the U.S. 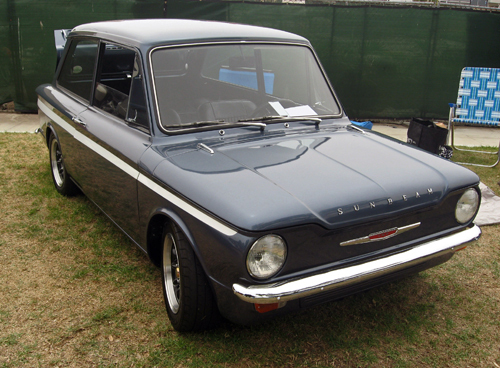 While my parents lived in Paris during the mid ’60s, they owned a Simca 1000, one of the many Corvair clones. I drove that car to the 1967 Le Mans 24 hrs and watched Foyt and Gurney make it two in a row for Ford. Thanks for the fantastic story of the Opel GT. The latest in a long line of brilliant, well researched and informative stories about the auto industry and its most interesting products. I always lusted after one of these when I was in high school. Keep the great stuff coming. I owned two Opel GTs at different times in the late 1970’s. One of them was the actual J. Edgar Opel (! ), so I can attest to its still existing in 1977-1978, in upstate New York (Dutchess County). By the time I had it, it had passed through several hands. The original paint job Car& Driver gave it had been painted over in a not-very-appealing metallic brown. It still had all of its C&D installed modifications, exhaust, etc. The engine was a little tired by the time I had it, compression was down – it had led a “well used” life by every owner flogging it in the spirit of C&D. It was an absolute blast to drive. Up until then my interests leaned more to American iron – Mustangs and the like were a core part of my automotive formative years. J. Edgar Opel, low compression notwithstanding, opened my eyes to how much fun a great handling ‘European sports car’ could be. At the time it was nothing less than a religious revelation – it would take hard 90 degree turns at 40 mph with barely a trace of body lean. The stock Opel GT I had which came before it was a delightful car, significantly mroe civilized than the MBGs and the like of the time, much more comfortable and practical as a ‘daily driver’ sports car, but J. Edgar Opel was a mystical experience for me. I traded it for a 1972 Camaro SS396 – mistake. The person I traded it to was going to rebuild the engine and repaint it back to the original C&D colors. I didn’t personally stay in touch with him, but heard through the local grapevine that he wrecked it hooning around one night, which would have been around 1979. The rumor was that a few years later the wrecked car was still in his garage in Kingston NY in the early 1980’s. I’ve now owned 103 cars in my 38 years of driving, and this is one of the ones I regret selling. I’ve been trolling e-bay and craigslist for years looking for a nice, stock GT. Hello, I don’t know if you’ve found your dream stock opel gt or not, but I have a 1970 1900 GT that is almost all stock except for things you wont miss like the original solex carb, and Points. it has a weber 32/36. it has electronic ignition and an aluminum radiator. it has an added ignition relay and a modern sony stereo. but the engine,transmission and exhaust are all original, as is the interior. here is a link to my CL post, which will be active until it’s sold. some great pictures. my plan for it was to install a 98 VW TDI engine(minimal computer)using an Acme Adapter and a Toyota 5 speed, but this car is too nice at 44 to go swapping in a non stock engine and the stock engine runs beautifully and sounds so nice it would be kind of a shame. it’s a very exotic looking car for sure. Thank you for the memories, so to speak. I was in Munich in the summer of 1970 where I saw a red Opel GT in its natural enviroment on Belgium Block pavement. A fantastic memory. I returned home excited and smitten by the GT. Later in late spring 1971, I learned that the local Buick dealer had a red 1970 1.9Litre CIH GT in stock which had languished at the dealership , I initially believed, because of competition from the Datsun 240Z and Porsche 914. I was able to buy that car with a $500 discount for about $3000. Later I learned that Opel GT’s sold because of enthusiasts like me despite the indifference of Buick and its dealers to the Opel brand. Buick never properly understood the potential of the GT and later the Opel Manta, but we owners did. Shortly after I bought the Opel GT, I swapped out the stock Goodyear tires for Michelin XAS tires, added a rear anti-roll bar, and Koni shocks–the results were transformative. It was such a fun car to drive both in summer and in winter with snow tires. I also loved watching the headlamps swivel with the forward push of the headlamp lever–because it was a manual system, the headlamps never failed to open and engage, summer or winter. During the winter there were many great skiiing road trips to Vermont with the GT initially stopping at Smith College in North Hampton to pick up a girl friend on the way usually to Stowe. The GT easily ran at over 100+ on the Interstate with two sets of ski’s on the diminutive ski rack. Driving the GT on Vermont 100 was always great fun. It handled the curves with the pleasure one experienced during a fun mogul run. Wow, was it fun. The only downside of the GT was the poor rust conditioning/prooofing. By 1976, despite solid mechanics at about 113,000 miles, the tin worm had been very destructive and I unfortunately sold my loved Opel GT for the worst car of my life, my disastrous VW Rabbit–but that is another story for another time. Thank you for reminding me of all of the great miles and smiles I had with my GT. Rust seems to have been an endemic problem with the GT. The GT’s body WAS rust-proofed by Brissonneau et Lotz, but from what I can tell, the design of the body structure appears to have made it particularly susceptible and more challenging to repair once rot (or serious collision damage) does set in. The Steinmetz kits were available in the US. They were sold and installed by MORE Opel in Seattle. Modified Opels with 125 to 140 BHP gave spirited performance, easily matching the 240Z, but for much more money! I’m sorry, I’m not able (or qualified) to assess or estimate values for cars. I am trying to restore a 1973 Opel Gt. anyone know a mechanic in Toronto that can help with an engine swap or fixing the original engine? anyone have an old body they would like to sell? The 1900 engine I fItted a down draft 2300 ford pinto carberator and it fit with a manual choke. Thank you for the article. I had heard and read of the Corvette connection in a Corvette magazine article and it made passing reference to the link between the Corvair and the GT. I bought a field-find 1969 GT a couple of years ago sort of as a joke. We’d paint it up as a Compuware Corvette and take it racing in the 24 Hours of LeMons. That was three years ago, and the little car has done well in its 12 or so races plus a trip to Bonneville. It certainly has grown on me, and it has developed a bit of a following in LeMons circles. To show you how much I have been sucked into the Opel world I am now the editor for the Blitz, the Opel Motorsport Club’s newsletter. I’d love to be able to reprint this article in the Blitz. BTW, Opel GTs and to some extent the Mata are still well supported. There is a company in California that hoards old parts and when needed has reproduction parts made. The is also a company in Germany that does the same. Prices are very reasonable. If you’d like to talk about reprinting the article, drop me a line — I’d be happy to discuss it. Thanks! I happened on this article, and my post above, while researching the J Edgar Opel. I never got your reply. I’d still love to be able to reprint the article. I either missed, forgot, or somehow lost your inquiry. Feel free to send me a message via the contact form and we can discuss it. My apologies — I do try to reply even if the answer isn’t always yes. Where can I sell 1969 opel gt engine and transmission in good running condition.I am located in south western Virginia and its taking up space in my garage and needs to go. Sorry, I can’t help with buying or selling cars or parts! I had a neighbour, when I was a boy in the 1970s had a 1971 Opel GT coupe. At the time, I thought it was the ugliest car in the neighbourhood. At the time, I thought the Toyota Corona and Corona Mark II was the best looking car, or the American Chevy Nova. But with time, I found the car more attractive than any of the American cars sold during the 1970s and the 1980s. And certainly better looking than the Toyotas, Datsun/Nissan cars sold during the 1980s. 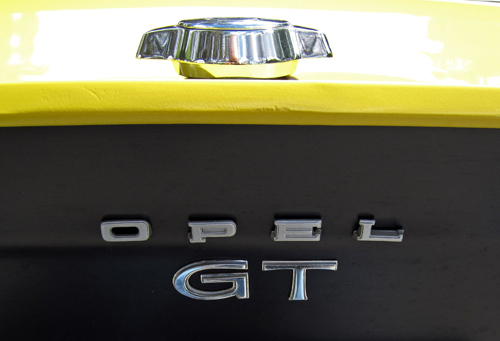 GREAT article and a great reference for restoring my 1970 GT! Always loved this car. Mine was a Orange 1972 with white interior. Once on a whim I drove it to find out the best mileage I could get on level roads at 55mph I was able to get 36.2 mpg. The car had 47000 miles on it, all stock. Sold it for what I paid for it in the 70’s. Wish I had never sold it, never saw a better one even the clock ran perfectly. Great history on the GT! Thanks! Age 16, I had saved my pennies for 2 years working part time after school and mowing grass on weekends, bought a 2 year old 69 1100cc GT. It was silver with red interior, a great color combo for this car I thought. It was very reliable and ran good even with the small engine, I sold it after 3 yrs for what I paid for it! I’m not able to help with parts, sorry! Contact Gil at Opelgtsource.com I am sure he can help you locate a tank. I have a tank for a GT and other parts, but I am fairly sure it is not the same for the 1900. Great read, really enjoyed it. I have a ’74 Manta which has been away from salted roads most of its life, so it didn’t succumb to rust. As a kid, I remember going to the Buick dealer with my father around 1976-77. At this particular dealer, there was only one Opel sign, way around the back nearly hidden from view. All the European Opels were gone, but there were a couple of Isuzu-built coupes in stock, one which had a turbo. We test drove one while waiting for our car to be serviced and I remember Dad liking it quite a bit. But the salesman told my dad who wasn’t knowledgeable about cars that all Opels are junk. I have to wonder if some of that indifference was defensive, especially after the demise of the Bretton-Woods system started making the German-built cars more expensive. It may just have been a matter of smaller dealer margins, of course — a salesman is almost always going to try to talk you into a car on which he makes $200 over one on which he only makes $100.